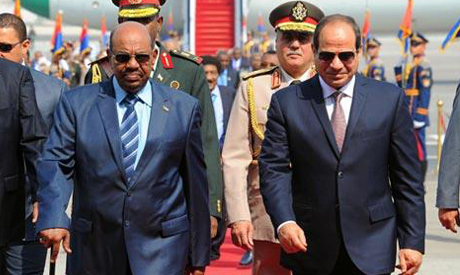 Sudan’s President Omar Al-Bashir is set to land in Cairo for a one day visit to meet Egypt’s President Abdel-Fattah El-Sisi, a statement by the Egyptian presidency said Sunday. In an official statement, presidency spokesman Bassam Rady said Al-Bashir’s visit to Egypt comes under the two leaders’ commitment to bolster bilateral ties between the two brotherly countries. and build on the outcomes of the second session of the Egyptian-Sudanese Higher Committee (ESHC) which convened in October. The two leaders will also discuss regional and international issues of common interest. They are set to hold a press conference at the Presidential Palace after concluding their talks. The Sudanese president’s visit comes as his country continues to plunge into political turmoil with tens of protesters reported dead since rallies erupted mid-December following a governmental decision to raise the price of bread. The demonstrations have called for Al-Bashir's resignation.